Holding an evangelism series in a remote part of the country is not an unusual event in Kenya. For years, the Seventh-day Adventist Church in Kenya has been working hard to reach every corner of the country with the Adventist message. The approach typically results in baptisms and the start of a new congregation. But there was a problem. The new believers didn’t have a permanent place of worship—until now. 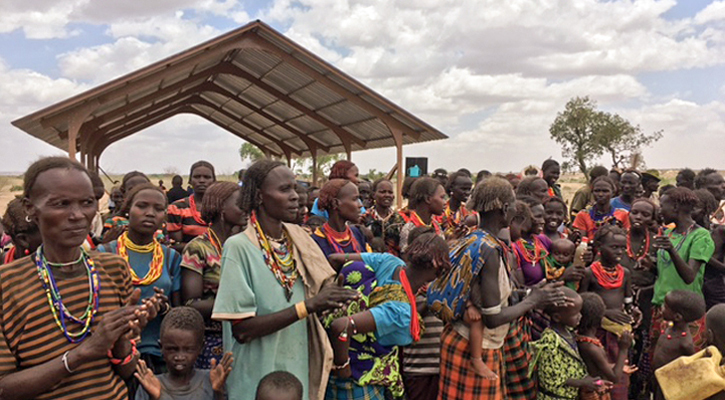 In early October, the Adventist Church in Kenya embarked on a campaign to reach the Dasaanach tribe in northern Kenya. The Dasaanach people are a semi-nomadic group who dwell in parts of Ethiopia, Kenya, and Sudan. In Kenya, a contingent of Dasaanach live in the remote village of Ileret, located on the eastern shore of Lake Turkana and near the Ethiopian border. After weeks of evangelism meetings, Bible studies, and baptismal classes, the Adventist Church baptized 765 people of the Dasaanach tribe and established four new congregations. Four missionaries will stay in the Ileret area to continue nurturing the new groups, and each congregation now has a One-Day Church, constructed by Maranatha Volunteers International. The actual construction took place during the meetings. The synergy of both projects unfolding at once created a positive energy and enthusiasm in the village. “The churches built by Maranatha were a great blessing to the communities. The speed at which the beautiful churches were erected amazed the community. Having a place to worship their God gave the people hope, pride, and joy,” said Robert Tinega, director for evangelism for the Adventist Church in Central Rift Valley Conference. The gratitude was so great that one tribe offered a goat to Maranatha, a gift of tremendous value from the Dasaanach, who have little food or water available to them. The tribe is extremely isolated in Ileret; bearing construction materials and gear, it took Maranatha’s crew four days to reach the village. This is a new region for outreach for the Adventist Church, and they have asked Maranatha to build a total of 15-20 churches in the area. There is also an urgent need for clean water, and Maranatha will be examining the possibility of providing wells in Ileret.